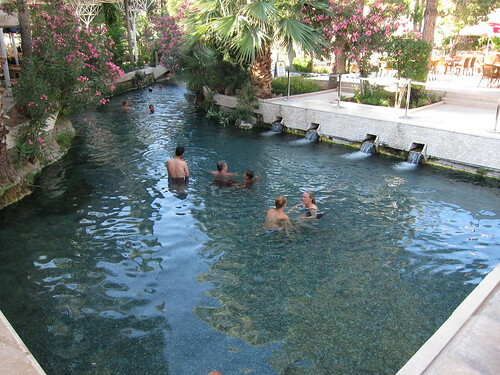 This article is part of the “A Couple of Weeks in Turkey” series and follows A Couple of Weeks in Turkey, Part 3: Pamukkale. 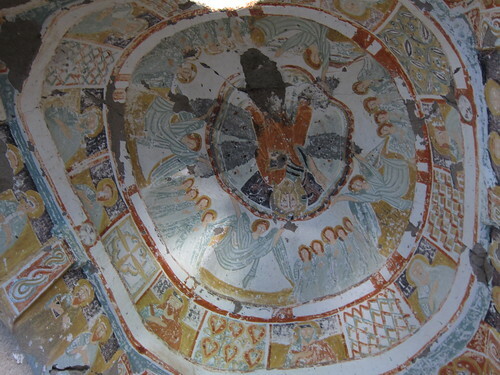 Eleven hours on a bus is not an easy feat so when we finally arrived at Göreme we were tired as hell. After asking for our pension at the tourism information desk, a van came from the pension to take us there and fortunately they serve breakfast even if you arrive at 7 AM like we did. 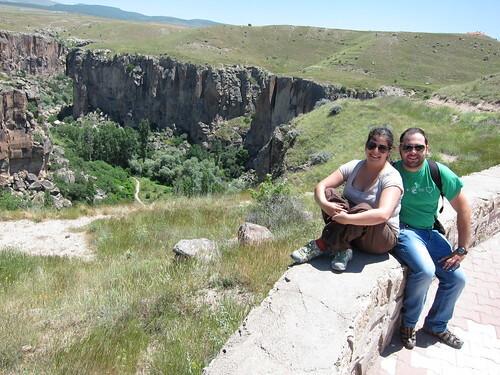 The place was Anatolia Cave Pension and was the best place we stayed during the whole trip. 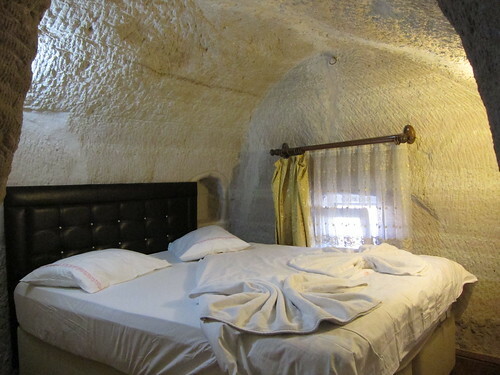 When we arrived we were told that we had booked a regular room but some guests had cancelled their cave room so we could stay there for the same price. It could not get any better! The owners of the Anatolia Cave Pension are a Norwegian lady and her Turkish husband and they have been able to create a pleasant place with a family atmosphere where everybody is always smiling and eager to help. Seriously, even the breakfasts were some of the best we had in the whole country. Of course we didn’t know this before and when the owner told me that he wanted to talk to us about the tours in Cappadocia (interestingly it means “land of beautiful horses”), etc. after we had breakfast I remembered the previous night’s saleslady from hell and got suspicious but I was wrong. He started by telling us “I am going to present this to you once and if you are not interested I will not bother you anymore”. The tour and balloon ride prices were good and he even gave us a discount that later would, when talking to some other people who rode with us, we realized we payed less than anybody else. If you’re interested, the balloon ride was 110 € per person and the tour must have been 35 € or so. After we settled about the tours we took the rest of the day for resting and walking the town. The next morning, the alarm painfully woke us at 5 AM because balloon rides are during the dusk when the air is colder which makes it easier to maneuver. 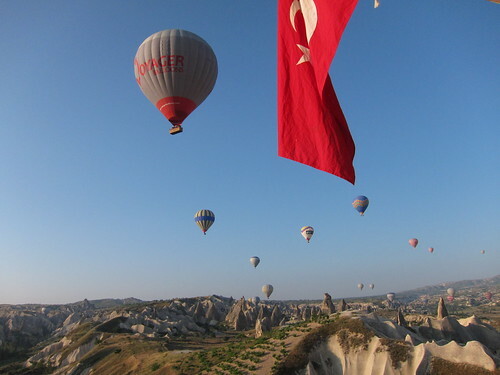 Over 50 balloons from different companies illustrate the skies of Cappadocia every morning. We were flying with the Ürgup company and the pension’s owner took us to the rendez-vous where tea and cookies were awaiting the sleepy tourists. Soon after the company’s vans took us to where the balloons were being set up. The ride was magnificent. It felt so smooth and quiet apart from when the pilot opened the engine’s gas and the flames screamed into the balloon, taking us further. The landing time is often schedule with a bit of a margin because the pilots only control the height of the balloon, the direction is decided by the wind. We ended up riding 20 minutes more than the planned hour which made it only better. The landing process is tricky, when the balloon is close to the floor, a team of several people try to control it with ropes and direct the balloon’s basket to land on top of a pickup truck that will transport it back to its place. Once we get off the basket we get to drink champagne on the spot, and take photos with the pilots and the flight certificates they sign and give us. It felt even better when our pilot, Derya, told us she was the first balloon pilot woman in Turkey! We will never forget it. After the balloon ride, we went back to the hotel to have breakfast and get our strength up again because a couple of hours later we would have the tour. 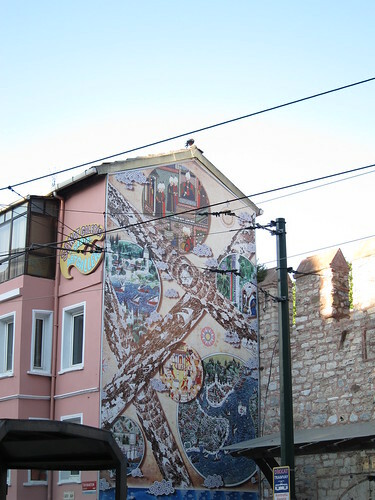 The trips are identified with four colors and we picked the green tour which had a visit to the Göreme panorama, the Derinkuyu Underground City, the Ihlara Valley, etc. While in the balloon we had met a Brazilian couple that helped us take some pictures and although they were in a different hotel, of all the vans in the tour we got together in the same one making it a funny coincidence and they were also the reason the tour ended up being funny and not a complete failure. 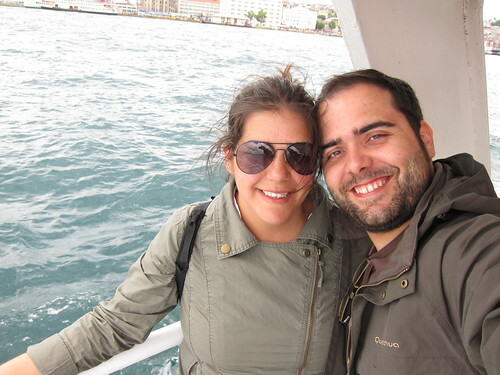 Back in Spain I would find out that besides being such nice people, Sérgio Leo and his lovely wife Marta Salomon are two famous journalists in Brazil. So why could the tour have been a complete failure? Because of the guide. Picture the worst guide in the world; there you go. Inside the Derinkuyu Underground City, after passing through some tunnel passages while ducking, he would “explain” what a room used to be in a *very* summarized way. His English skills didn’t help but it wasn’t just that. For example, when Sérgio asked him how old was a church we saw outside the Underground City, he proudly told us: “Many, many years!”. Very helpful indeed. After wondering around for 2 hours trying to find them (including speaking to some Turkish people) we decided we should had back which implied going up a large number of steps again. Back uphill we waited a bit, then asked the guys in a restaurant about the guide and he knew where he (and us) was supposed to be having lunch. Only after about an hour and two calls a van finally came to pick us up. When we arrived at the place where everybody was finishing their meals, the guide came by and said he was looking for us. For the fun of it I asked and yes, he first had his lunch calmly before going back to search for us; I guess he needed some energy. At least he apologized. In the end of the day, back at the hotel I told the owner about our tour adventures and he promptly called someone and started complaining in Turkish. After the call was finished, he told us that the guide wasn’t supposed to be that guy but the regular one was on his honeymoon and they asked him to fill in. This means you don’t have to be afraid to do a tour and perhaps you are not gonna meet great people like we did. We still had another thing to do that same day. 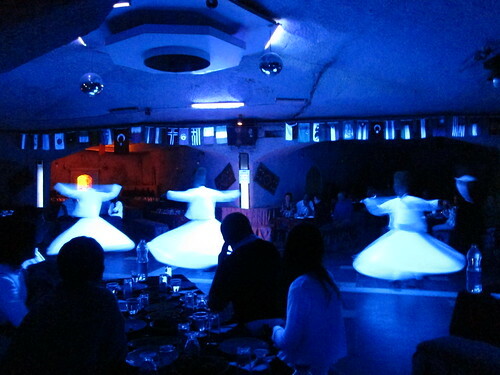 We had booked the Turkish Night Show, a dinner with traditional Turkish music and dancers. Our pension’s owner kindly took us there and the show was nice apart from the cold we felt at the place (so don’t go with only a t-shirt like we did). The next day we said good bye to the awesome people at the Anatolia Cave Pension and took the bus we booked a day before to Ankara. The plans for Ankara didn’t go well but I’ll leave that for the next post. This article is part of the “A Couple of Weeks in Turkey” series and follows A Couple of Weeks in Turkey, Part 2: Selçuk/Ephesus. 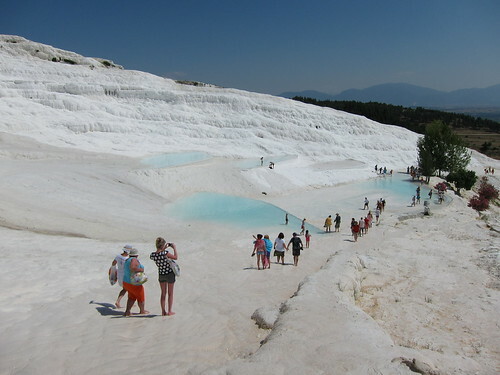 The next stop after a well spent time in Selçuk was Pamukkale. 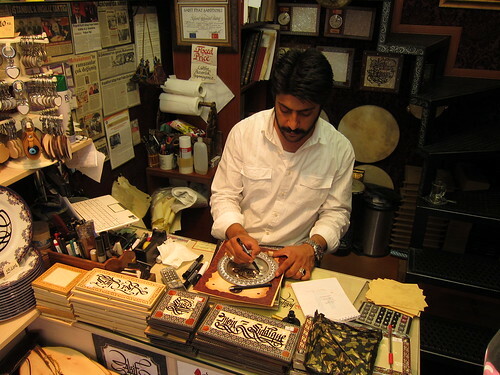 The owner of the Tuncay Pension had helped us with our trip planning. He told us Pamukkale was not worth spending the night and instead we should rather get on a night bus to Cappadocia, saving time and money. It was a wise advice but before we were on our way we had another little Trukish adventure. 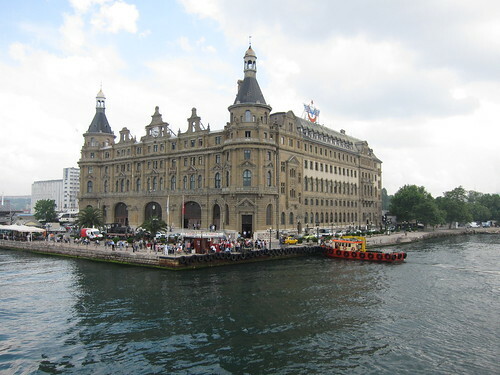 The hotel owner told us he would talk to his friend at the bus station to get us tickets and we should make sure that we headed to the right agency, Kamil Koç. We insisted on going for the original agency and he told us “you know, you can go for that agency but my agency is the one with the bus so they will sell you a ticket for my bus, earning a fee, and tomorrow I will be here to happily welcome you”. Hmm, how could we argue with that? We said okay but he told us a price that was higher than what we had been told before so we bargained and finally we could get two tickets to Cappadocia with a stop at Pamukkale for the price of 70 TRL each (~35 €). We wanted nothing to do with those travel agencies’ wars so we went to have lunch at a restaurant from which we could see why Pamukkale means “cotton castle”. Behind some houses we could see a big white mountain that could be easily confused for snow which looked and felt odd with such a hot weather. 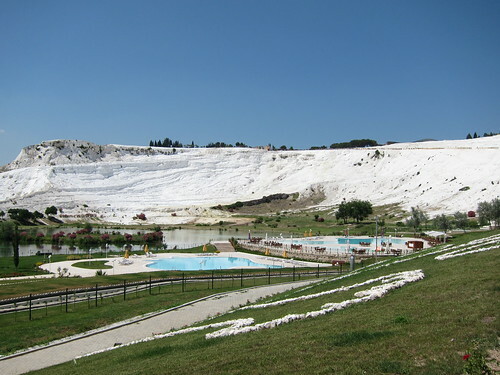 The reason the mountain is white is a rock called travertine made by calcium carbonate deposits. The lunch was tasty, as always, but at the end of the day we would have an unpleasant situation with the owner of that place (which apart from a restaurant is also a hostel and a travel agency). After lunch we headed to the “cotton castle”. The entrance fee was 20 TRL (~10 €) and it is forbidden to wear shoes in there so people don’t deteriorate the soil. There are guards around and they will blow a whistle at people who sneaked in with their shoes on or people who seat inside the water stream (blocking it) that goes along the main course of the mountain. Some times it was hard to walk at some places which had small loose rocks but it was a nice experience. Another main attraction of that mountain is the number of pools where people can bath. The water is of course full of calcium carbonate deposits which give it its pale look and you can feel it in your feet as some kind of weird paste. After we got to the top, we rested a bit laying on the grass under some trees’ shade and then went to the ancient pool. There is an extra fee for entering the ancient pool but what other opportunity would we have to swim on top of ancient roman ruins? So there we went, the pool’s water is warm and sweet and ruins divide different areas of the pool. We could seat on some ruins, swim and relax for a while. When we got out, we saw they had “doctor fish” tanks in there. We had first known about “doctor fish” in the TV, tiny fish that eat dead skin of one’s body and leave the healthy skin really smooth. After a failed attempt to bargain the price of 35 TRL, we decided to do it anyway. For 20 minutes we were seating with our feet in the fish tank, feeding the fish and paying for it, that is! The feeling is like some fast and small tickles, Helena could not stop laughing for a while until she controlled herself. After we were done with the pool and the fish we went down the mountain again to be there for the bus at 19. When we got to the office where we had left our bags, the guy told us: “What are you doing here so early? We had more people that needed to take the bus so we delayed it to 20:30!”. Yup, they delayed it without any warning or consideration for us. When the time came, we seated in front of the office next to the restaurant where we were supposed to get our night bus ticket and this is where the situation I mentioned before started. The Canadian guy went inside the office and came out with a piece of paper for the three of us (note that we didn’t know each other) that was supposed to be exchanged for a ticket at the bus’s station. So there we were seating in front of the office, waiting for the bus and the restaurant’s owner, a woman in her 50s, started talking to us. 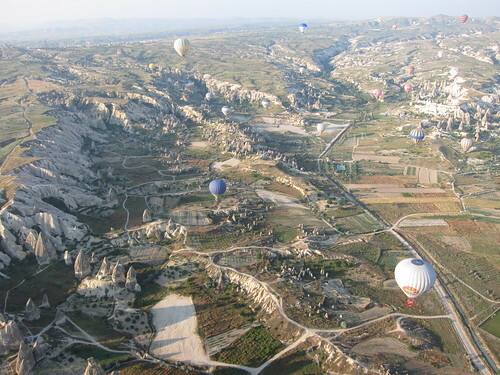 “So you’re going to Cappadocia… Do you have any planned trips in there? You should probably book in advance because they get full and then it’s a shame you don’t get to visit the stuff in there”. “Hmm, we don’t like tours that much so I guess we’ll decide about that when we arrive in there…” I said but she just went on and on about how such good prices they have, about how much cheaper it would be to book with her, etc. Finally the Canadian went inside and after a while the woman told us: “Your friend has bought every tour and even a balloon trip! You should also buy some tours… Do you speak Spanish?” and she went on talking to us in Spanish. It wasn’t about the money anymore, it was about not giving in to that sick woman so I told her in English: “Look, we speak Spanish but we also speak English as you might have noticed, we are not even Spanish, so you don’t have to speak in another language! We are not buying anything so please stop trying to sell us stuff!”. We were really pissed off and on top of that the bus was late so that was a really unpleasant couple of hours. Finally the mini-bus arrived, it was a dolmuş (read the part 2 of this trip to know more about these buses) and was gonna take us to Denizli’s bus station. 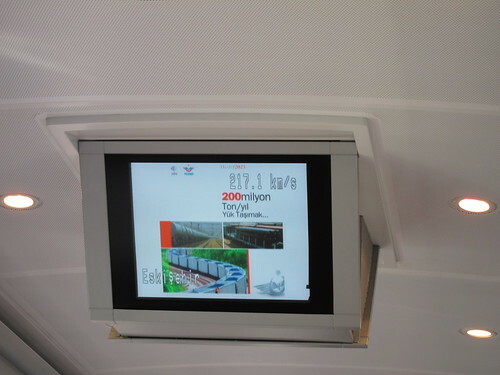 After an uncomfortable trip in a dolmuş full of people where I seated at a small stool in the aisle we finally arrived. We went inside the bus station, showed the piece of paper to the first assistant that we saw and he pointed us to the right place where we finally got our individual ticket and then we went outside to wait for our bus. Next to us were some Korean guys talking to each other about a piece of paper they had. I decided to ask them if they were going to Cappadocia on a night bus; they were but they thought that the piece of paper was a real ticket and didn’t know anything about exchanging it for a real ticket and were waiting for the wrong bus number so I think I saved some Korean folks from spending the night at Dinizli bus station. When the bus arrived we hopped on and had our seats next to the Canadian. I was seating next to Helena and our new friend was seating on the other side of the aisle next to a woman. The ticket inspector came buy, took a look at our tickets and started yelling something in Turkish and giving directions to us. Finally we understood, the tickets have the passenger’s genders printed on it and he was trying to switch Helena’s seat with the Canadian so the other woman wasn’t seating with a man but she said she didn’t mind and Helena claimed she was married to me so the guy gave up in the end. 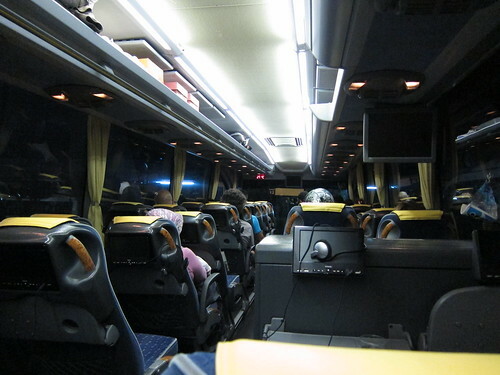 The bus was equipped with a small TV for every passenger (one of the channels was from a camera in front of the bus) and they served snacks and drinks. Still, this 11 hour trip was more uncomfortable than I thought. Every time the bus stopped the lights went on, then there were people coughing, children crying, the sound of the water hitting the windows when they washed it (they washed it at every stop). We didn’t have much sleep but we saved a night and had this experience.